Tarzan’s eyes were laser focused on the small ball in Chad Shuman’s hands. It was the dog’s turn at the Indiana State Fair Dock Diving Competition. The crowd was roaring and the smell of fair food filled the air, but the ball was the only thing that existed to Tarzan in that moment. Right on cue, he begins to run the several feet down the platform as his owner throws the ball toward the water. Tarzan leaps off the platform and several feet across the pool before finally making his way back down to earth with a massive splash. It’s hard to imagine that not even one year earlier, Tarzan didn’t know how to obey even the most basic of obedience commands. Before being adopted by Shuman, Tarzan was living at the Humane Society for Hamilton County (HSHC) as a shelter dog. But in August 2017, he was chosen to be one of 5 shelter dogs chosen to participate in the first session of Paws & Think’s Hamilton County Youth-Canine Program. The program pairs at-risk youth from Hamilton Youth Assistance Program with shelter dogs to train them on basic obedience, improving their adoptability. For the program, Tarzan had been paired with a teen named Liam. But on day 1, Tarzan was having none of it. He struggled in new environments, and refused to follow any of Liam’s commands. But Liam had an idea. “What if I give him a ball?” he asked, thinking that a toy might help Tarzan focus. It worked. “Just like that, he connected with that dog,” said Executive Director, Kelsey Burton. Although Liam had broken through with Tarzan, it wasn’t completely smooth sailing. Tarzan still had his stubborn moments when he decided to “quit” his training for the day and lay down on the floor. But Liam never gave up. In those moments, he would “lay down next to him and would pet him and love on him and just kind of start to teach Tarzan that it was okay to trust another person,” said Burton. Liam’s persistence paid off for both him and Tarzan. He kept working to build trust with Tarzan throughout the week, and by the end of the 5 day program, Tarzan was thriving, even jumping through hula hoops. But it wasn’t just Tarzan that had grown. Liam had also made huge strides during the week, going from “not even being able to be in the room” at the beginning of the session to “being a leader, and demonstrating that,” said Tricia Straus, an Advocate with the Fishers Youth Assistance Program. “He was probably our star of our program from the standpoint that he benefited the most,” said Burton. She explained how Liam gained confidence through the process of taking a scared shelter dog like Tarzan and through persistence, finally earning his trust. “He taught the dog those skills. That was totally him and he can have that accomplishment,” Burton said. Tarzan was soon adopted by Chad Shuman. 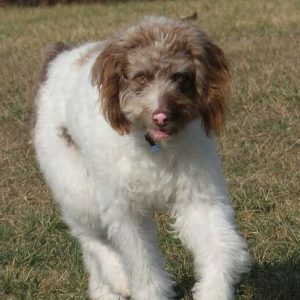 As an athlete, Shuman had been looking for a dog that could join him on his runs. “I was kind of thinking a dog that could go and run and be active with me, and he is a champion at that,” he explains. And a champion Tarzan is. His results from the Dock Diving Competition? First place. And to think, it may have never happened without the help of a teen named Liam. Lisa Jones and her dog Rookie have been volunteering with Paws & Think for over four years and have been able to make a positive impact by visiting all different types of venues as a therapy team. Lisa is an RN who has worked as a realtor and broker for the past 16 years, and she says her favorite part of volunteering with Paws & Think is seeing the difference that Rookie makes in people’s lives – “He can help in a way that humans can’t.” Lisa is passionate about Paws & Think because she can see the value that it has in the community. Together Lisa and Rookie have had many memorable experiences volunteering. In our end-of-year appeal, we highlighted the story of Rookie’s visit with an unresponsive stroke patient who had a breakthrough moment in his recovery when he was able to speak to Rookie and feed him a treat. On another visit at IU, Rookie and Lisa went into the room of a woman who was terminally ill. Her husband, who was grieving, was skeptical about allowing Rookie to visit. “What good will this dog do?” he asked. When his wife placed her hand on Rookie’s head, everyone was amazed to see her heart rate decreasing on the monitor, proof of Rookie’s calming effect on her even in such a dire time. Rookie, an English Yellow Lab, has been with Lisa since he was 11 months old and has been volunteering since he was a year and a half. Lisa is married and has three sons and three daughters-in-law, and when she is not volunteering with Rookie she enjoys needlepoint, reading, and volunteering with women who are overcoming addiction. 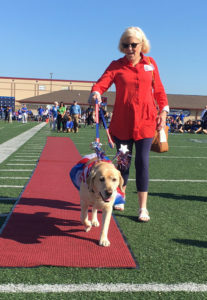 Their family has two new additions – Lisa’s first grandchild, and a new English Yellow Lab puppy, who Lisa hopes can also become a therapy dog someday. A recent tragedy at a high school found the students struggling to cope with the death of some fellow classmates. How did Paws and Think help these kids? Reporter Adam Dunn shows us how therapy dogs from this organization delivered just the right soothing touch for the emotionally paralyzed pupils. 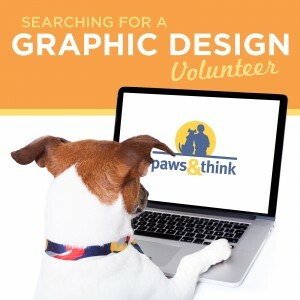 Paws & Think will be piloting a new Youth-Canine program this year in partnership with Hamilton County Youth Assistance Program (HCYAP) and the Humane Society for Hamilton County. The new Hamilton County Youth-Canine Program will be held two times in 2017, and the inaugural program starts this week. The program will be led by Paws & Think’s Youth-Canine Coordinator, Kim Trimpe, and each training team will consist of two high school aged students, one dog, and one adult Paws & Think volunteer who will act as a mentor for the youth. This new program will follow the same model as our other Youth-Canine programs, with the goals of teaching valuable life skills to the youth and increasing chances of permanent adoption for the dogs. HCYAP provides programs that promote positive growth and enhance home and community relationships for at-risk youth in Hamilton County. Teens who are facing challenging life circumstances have been selected by HCYAP staff to participate in our Youth-Canine program pilot with the goal that the program will teach them about opportunities to make their lives better. Youths will learn the value of working together towards a common goal, and our Paws & Think mentor volunteers will help to demonstrate that kindness and positive reinforcement can produce results and pave the way towards opportunities and success. Training sessions will include discussions about leadership, trust, empathy, safety, and will focus on positive reinforcement training for the dogs. 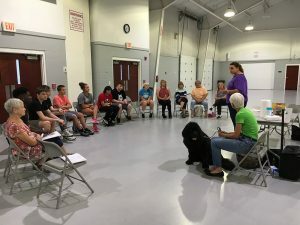 The Hamilton County Youth-Canine Program is the first program of its kind to bring together Paws & Think, HCYAP, and the Humane Society for Hamilton County. The second round of the pilot program will take place in the fall. Paws & Think is also currently working with Dr. Eric Grommon from IUPUI to develop statistical measures for our Youth-Canine programs to better quantify the positive impact of these programs to our community. Learn more about our Youth-Canine programs. 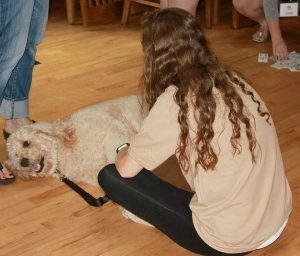 Indianapolis, Indiana – Paws and Think therapy teams assisted the students at Warren Central High School after tragedy struck last month. Therapy teams were called in three times to help students cope with the shooting of three classmates. Dogs are often used to provide comfort during a crisis because they offer unconditional acceptance in these situations. They give comfort through their willingness to be petted, hugged, or simply present with no words or actions. Crisis response requires training by dogs and their handlers. Paws and Think offers a four-hour training program to help handlers understand how others react to trauma. The therapy teams were brought into a room where grieving students had gathered. As the dogs moved through the area, students started to feel comfortable to reach out and connect with the dogs and talk with the handlers. Every person has a different reaction to the dogs during a crisis. Some interactions are short, while others want to spend time petting the dog and talking to the handlers. Warren Central received a lot of positive feedback from students, teachers, administrators, and community members about how much support the therapy teams were able to offer to grieving students. When Executive Director Kelsey Burton called with the tragic news that three students from Warren Central High School had been killed, Marcia Baker knew that her therapy dog, an Australian Shepherd/Poodle mix named Raisin, could be a source of comfort for the grieving student body. So off went Marcia and Raisin to Warren Central. It was a typical reaction for someone whose love of both dogs and helping teens in need goes back decades. Marcia grew up in St. Petersburg, Florida, in a dog loving family. Whether it was tramping through the woods or playing in the creek, dogs were a constant presence in her life. “I can’t remember a moment when there wasn’t a canine friend in the family,” she said. Marcia eventually became a teacher, working with at-risk teens in challenging environments and communities. More recently, she became the owner of three-year-old Raisin. Marcia described Raisin as playful, yet relaxed, as she recalled the time Raisin slept on her back in the crate on the way home from Kentucky, where she was adopted. 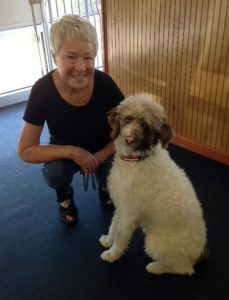 Marcia soon realized that Raisin’s happy-go-lucky nature was perfectly suited for a dog therapy setting. “When Raisin came into my life, I knew I wanted to share her with anyone who needed a canine friend,” she said. So when Marcia learned about Paws & Think while searching for pet therapy opportunities, she jumped at the opportunity for her and Raisin to get involved. The duo travel all over Indianapolis giving comfort to kids in venues such as IPS #34, Brooks Place, Coburn Place, and Julian Center. In addition to volunteering with Raisin, the Youth-Canine Program is a passion of Marcia’s given her background in helping troubled teens. “Getting back to this love of mine, along with my love of dogs, this program was just perfect for me,” Marcia said of Youth-Canine. For the program, Marcia has spearheaded the effort to develop new program training materials so that the program can be replicated in juvenile detention centers all over the country. 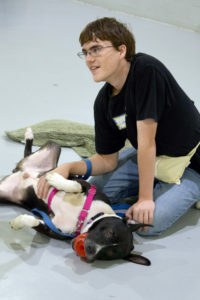 But while programs like Youth-Canine involve a highly structured training program where at-risk students teach the basics of dog obedience to their canine pupils, when it came to comforting students at Warren Central, there was no program that could prepare Marcia and Raisin for what they would experience. When they arrived at the school, the pair was greeted quietly by faculty and staff and instructed to just be available for the students. “Raisin realized that this wasn’t a time for play,” Marcia said. The pair wandered through the clusters of students who were sitting on the floor, standing along the hallways, and gathering in the counseling offices, trying to process the horror of what had happened. However, as time went on, lighter conversation emerged from the silence as the students began to bond with Raisin. They inquired about her breed (often a topic of mystery among those first meeting Raisin) and her love of full-body massages. Many of them would also begin to open up and share their own dog stories. “This seemed to ease them back into the ‘normal’ world again,” said Marcia. After several days of being available for students, fewer and fewer students continued to need help. High school counselors gently guided students back into class. By Thursday, the counselors informed Marcia and Raisin that their job was done. Although their calming presence was no longer needed at Warren Central, Marcia is ready to serve again if needed. Thank you to everyone who purchased a shirt, and thank you for supporting Paws & Think! There are new Paws & Think t-shirts available for all our volunteers and supporters! Throwback Threads Clothing Co. is offering two different shirts with 25% of sales being donated to Paws & Think. Be sure to pre-order your shirt before it’s too late! Click the links below to purchase the shirts directly from the Throwback Threads Clothing Co. website. In November of 2015, Katie Selzler came across a picture on the Indianapolis Animal Care Services website of a dark-haired retriever named Remy who appeared to be smiling at the camera. Katie was looking to adopt an older dog, and Remy was estimated to be about five years old at the time. Inspired by the gentle soul captured in the photo, Katie went to IACS to meet Remy, but was told he was not available for adoption because he was in a program at the Marion County Juvenile Detention Center. Intrigued, Katie went back to IACS every day for the next three days until she was finally able to meet Remy, who was by then a new graduate of the Pawsitive Corrections Youth-Canine training program. Katie and Remy took a quick walk together, and after seeing how calm, happy, and friendly he was with strangers, she knew he was the dog for her. Flash forward to 2017: Katie is searching online for ways to volunteer and give back to the community when she comes across Paws & Think. Having worked for animal rescues in the past, she was particularly interested in volunteering with an organization that worked with rescue dogs, and Paws & Think seemed like the perfect fit. 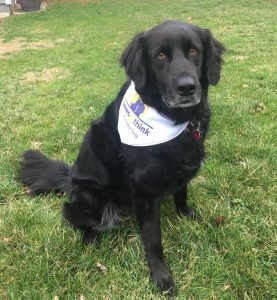 She and Remy soon enrolled in the pet therapy training class, and in March they passed their evaluation to become a registered Paws & Think therapy team. Katie says she and Remy plan to visit hospitals and nursing homes, specifically facilities that have memory care centers. Katie is looking forward to volunteering as much as her schedule allows, and we are thrilled to have one of our Youth-Canine graduates return to Paws & Think as a volunteer. Look for Katie and Remy at upcoming outreach events where they will be helping to spread the word about Paws & Think!